I write things. Most of them with line breaks, though sometimes prose. From time to time, people pay to publish or read them. I keep a poetry journal of sorts, mostly for posting early drafts, at DreamWidth. Lately, it's been mostly translations of classical Japanese poetry, which is fun if slightly overloaded with cherry blossoms and autumn leaves. Around 1235, Japanese poet and scholar Fujiwara no Teika compiled for his son's father-in-law a collection of one hundred poems by one hundred poets. Within its chronological summary of six centuries of Japanese literature, Teika arranged a poetic conversation that ebbs and flows through a variety of subjects and styles. The collection became the exemplar of the genre—a mini-manual of classical poetry, taught in the standard school curriculum and used in a memory card game still played during New Years. 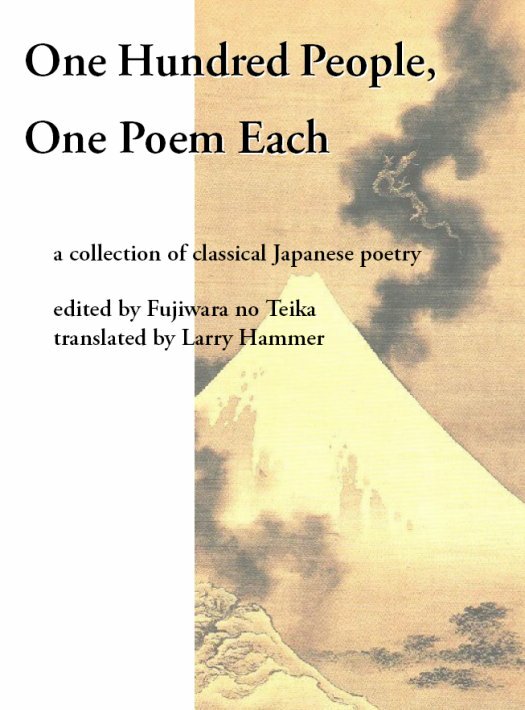 One Hundred People, One Poem Each contains the best that classical Japanese poetry has to offer—here presented in a new verse translation. The poems are translated in a form modeled on the originals, now called a tanka. Each translation includes annotations for context and the original Japanese in both kanji and romanized text, The book is available in a variety of formats, including paper from Lulu, ePub/Nook from Barnes & Noble, and mobi/Kindle from Amazon. You can preview the whole thing at the Lulu link, so you know what you're getting. Note that, due to formatting restrictions, the Kindle edition does not include kanji, so if you really want that, you'll want another one edition. If you're interested in more of this sort of thing and don't mind reading works in progress, I have a free ebook (ePub/Nook only) of the first four books of the Kokinshu anthology (c.905), including the poems of spring, summer, and part of autumn. I will be adding to it as I work my way through the collection, or however far I get—my current plan is to finish the first six books, covering all the seasons of the year, and then see where I'm at. For even rawer versions, you can follow my progress on DreamWidth as I post initial drafts, or on LiveJournal as I post collected revisions a book at a time. When I write my own things, I especially like narrative poems; sometimes, I manage to sell them as short stories. I do this as part of the Well-Versed Skiffy movement; our motto is "good storytelling, good meter, good speculative fiction" — think Speculative Fiction meets Expansive Poetry. We wanna tell ripping yarns in rhyme about magic and spaceships. To form a pattern readers could have used. In short, a bacchanalic rout ensued. Plague houses and the palace of the king. He couldn't stop the carnival of crime. And so no help with troubles he'd been dealt. For hero means "he scatters wide his oats,"
Like jetsam tossed from overloaded boats. The man, the myth, the legend—Heracles. Would later try to replicate that work. That still is read in this descendent age. Since he is judged by his domain's accord. He did what monarchs do, and prayed to Zeus. You can read the rest of the story here, and the sequel, "Myrmidons in Calydon," over here. Needless to say, this sort of thing is going to be the Next Hot Thing in SF/F. New Weird is already passé, the Interstitials have nearly crested—Well-Versed Skiffy is where the momentum's going. You heard it here first. To flattery, at least he read your rhymes. He'll never see my praise nor hear he's cursed. Stirred the bird, —the cleaning of, the preparation, a cook's trick. Times told tastier, more delicious, than plainer fare. Liver, onion lavered, then gulp good chicken stew. In addition, along with Janni Lee Simner, I'm half of Cholla Bear Cards, writing and designing custom greeting cards. I've also occassionally translated from Spanish and Latin, though right now I'm a bit rusty with both. And then there's translations into words of one beat, though I don't really count that as my stuff. The game makes for good finger exercises, though. Please let me know about link rot. © 2003-2014 L. N. Hammer, last updated 7 Aug 2012. Not just prose with line breaks.